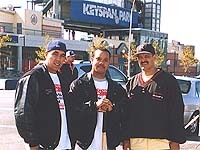 Longball finalists pose in front of KeySpan Park, home of the Brooklyn Cyclones. 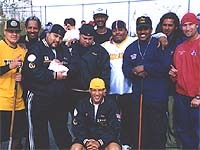 Brooklyn was host for both the opening and final event in this year’s Stickball Classic, but once again, it was a Bronx team that walked away with the title. Repeating their win from 2002, The Gold defeated challengers from the other boroughs and proved that they were the best team in NYC. Along the way, this year’s tournament had some notable highlights. 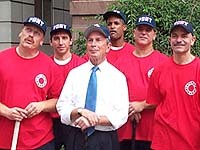 At MetroTech, the Mayor took some swings of his own before presiding over the opening ceremonies which included the annual longball competition between the cops and the fire department. Also of note was having a record 11 teams come down to compete in the Brooklyn playoff in Coney Island, introducing some new rivalries into ths NY event. 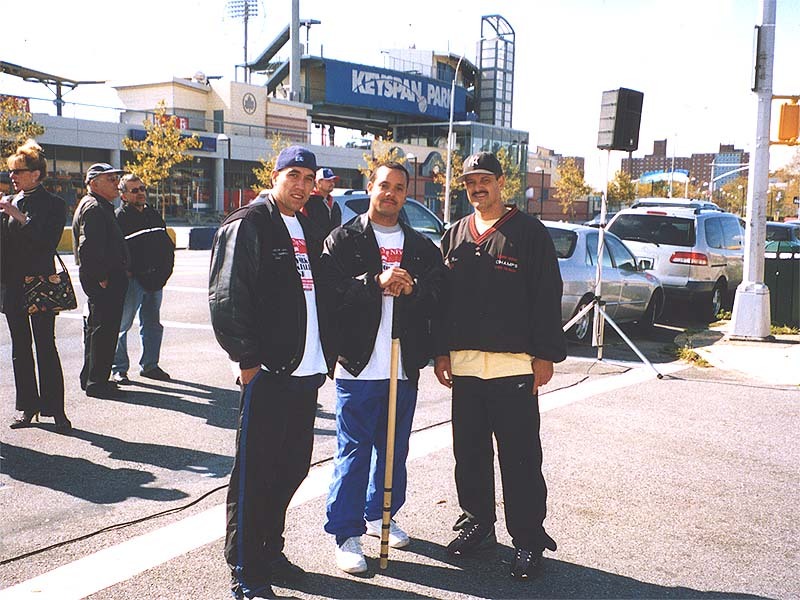 Once again fans were “treated” to the sounds of the Brooklyn Dodger Sym-phony while the players endured the barbs and wisecracks of stickball’s self appointed commissioner Curtis Sliwa. Take a look at the photos below and check out the coverage of the Finals. 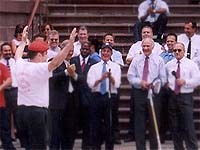 Curtis Sliwa soaking in the applause of the City's brass after whacking a 260 ft shot on his only swing. The Gold, repeated as the City's champs demonstrating why they are the best team in the City. 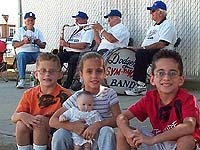 Young fans being "treated" to the music of the Brooklyn Symphony band at the Queens competition. 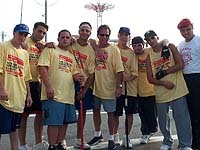 The Ozone Park Warriors were the surprise team in this year's competition. for its continued support of this legendary NYC street game.